Why do pathogens settle on animals called copepods? Amalia Aruda knows that tiny marine creatures have big impacts. Some can kill you. Aruda studies some of the smallest animals in the ocean—barely visible crustaceans called copepods and the bacteria that hitchhike on them. These include Vibrio cholerae, the bacteria that cause cholera, a disease that triggers diarrhea, vomiting, and rapid dehydration and kills more than 100,000 people a year. Copepods are the most abundant animals in the ocean and are critical links in the ocean food chain. They eat tiny marine plants, or phytoplankton, and in turn are eaten by larger animals from fish larvae to whales. But a grimmer chain links copepods to human misery: On the shells and in the guts of copepods reside many kinds of bacteria, including Vibrio cholerae. In college, Aruda had read about the oceanographer and microbiologist Rita Colwell, who was the first scientist to show that copepods played host to cholera bacteria and were associated with cholera outbreaks. Colwell showed that filtering drinking water in Bangladesh through silk saris—a mesh that isn’t fine enough to filter out bacteria, but that does filter out copepods—decreased the incidence of disease, proving that copepods were disease-carrying agents. Cholera is transmitted person-to-person, but ultimately, “the cholera comes from the environment, and it seems to come from these zooplankton,” Aruda said. “Copepods carry a lot of cholera bacteria, and seem to enhance the survival of V. cholerae in the environment. 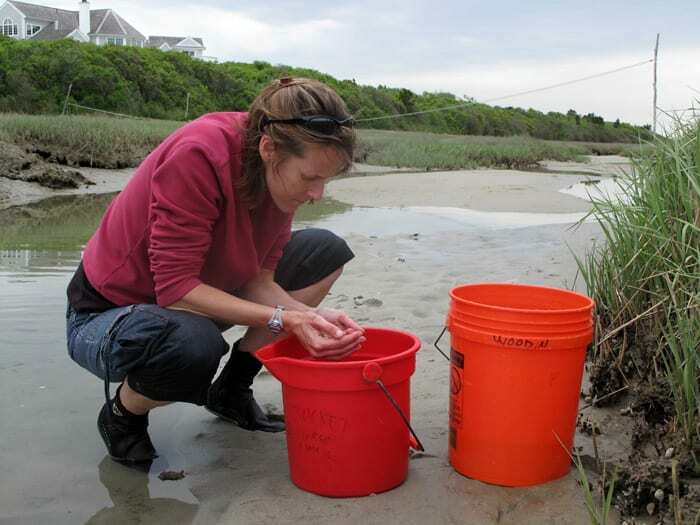 In college she phoned Ann Tarrant, a biologist at Woods Hole Oceanographic Institution (WHOI) who studies endocrine and immune systems in copepods, and became a guest student in Tarrant’s lab. Next Aruda was accepted in the WHOI Summer Student Fellowship program for undergraduates. Now she is enrolled as a graduate student in the MIT/WHOI Joint Program in Oceanography, working with Tarrant, her Ph. D. advisor, and with MIT biologist Martin Polz, who studies Vibrio on tiny marine animals, or zooplankton, such as copepods. The bacterial group Vibrio contains dozens of species, including other species such as Vibrio parahaemolyticus and Vibro vulnificus, which can cause serious gastrointestinal illness and infections in people who eat undercooked seafood or have contact with Vibrio-laden water. But most Vibrios aren’t harmful. Some may even be symbiotic with their host copepods, Aruda said. Researchers in Polz’s lab found that some Vibrios on living zooplankton produce antimicrobial compounds, maybe deterring other microbes. Aruda is investigating these ubiquitous relationships between copepods and bacteria—from both sides, the copepods’ and the bacteria’s. Fundamental questions remain unanswered. Aruda is exploring whether copepods actively respond to bacteria that settle on them, triggering immunological responses. On the flip side of her research, she is examining why bacteria settle on copepods in the first place and whether bacteria are selective about which copepods they choose as hosts. To learn how copepods react to Vibrios, Aruda is using the copepod Eurytemora affinis, a speck of an animal 1 millimeter (0.04 inches) long that was the first copepod used in labs to study copepod-cholera links. She treats Eurytemora with antibiotics to kill previously existing bacteria. With their slates effectively wiped clean, she exposes them to either harmless or harmful Vibrio. In response, genes in the copepods may or may not become activated to create proteins to deal with the infection. “Does the copepod recognize different Vibrios and respond differently by activating different genes and producing different compounds to combat or encourage them?” she asked. Aruda uses rapid genetic sequencing to identify which gene sequences in the copepods “turned on” in response to the harmful and harmless treatments. Then she uses a technique called differential expression analysis to match the activated copepod gene sequences to sequences for known immune-response genes in other animals—to see if copepods have immune responses to harmful bacteria. If they do, a similar “marker gene” might exist for copepods carrying the cholera bacteria—pointing the way for a test to detect water containing infected copepods and a new method to predict and prevent cholera outbreaks. Inspired by the Colwell’s work in Bangladesh, Aruda relishes the thought that her own research could have beyond-the-lab-bench applications too. Do bacteria react to copepods? 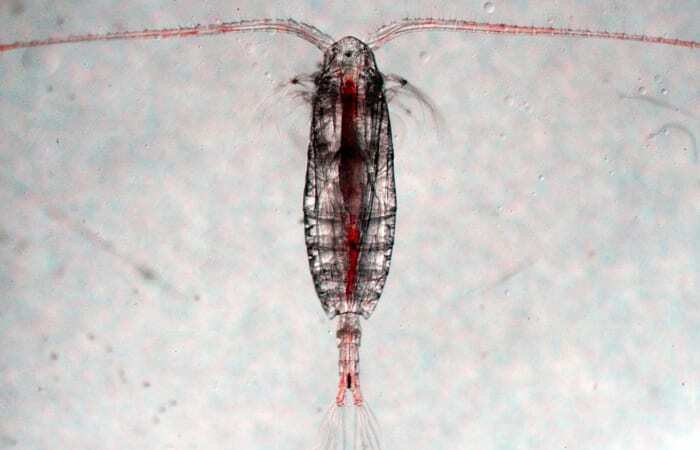 For her research on how bacteria react to copepods, Aruda is using Calanus finmarchicus, copepods from the North Atlantic Ocean that have two-phase lives: When food is plentiful, they swim actively near the surface; when food is scarce, they go into a dormant stage in deeper waters, sort of the zooplankton equivalent of a bear hibernating in a den in winter. 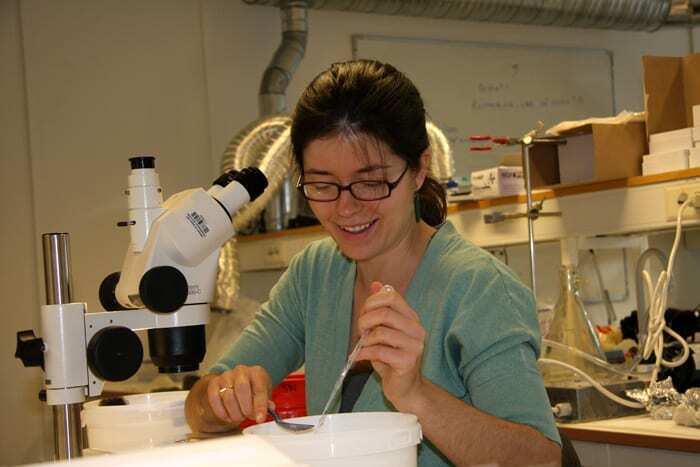 In 2012, she joined Tarrant and WHOI biologist Mark Baumgartner on an expedition to Norway, going out in boats to deep ocean fjords to collect both active and dormant Calanus copepods. Calanus finmarchicus, reaching 4 millimeters (0.16 inches) long, is one of the largest of all copepods. “It’s funny how what I used to think was ‘big’ has changed,” Aruda said. Amalia Aruda’s research has been funded by an Environmental Protection Agency STAR Graduate Fellowship, the National Science Foundation Graduate Research Fellowship Program, and the WHOI Ocean Venture Fund.